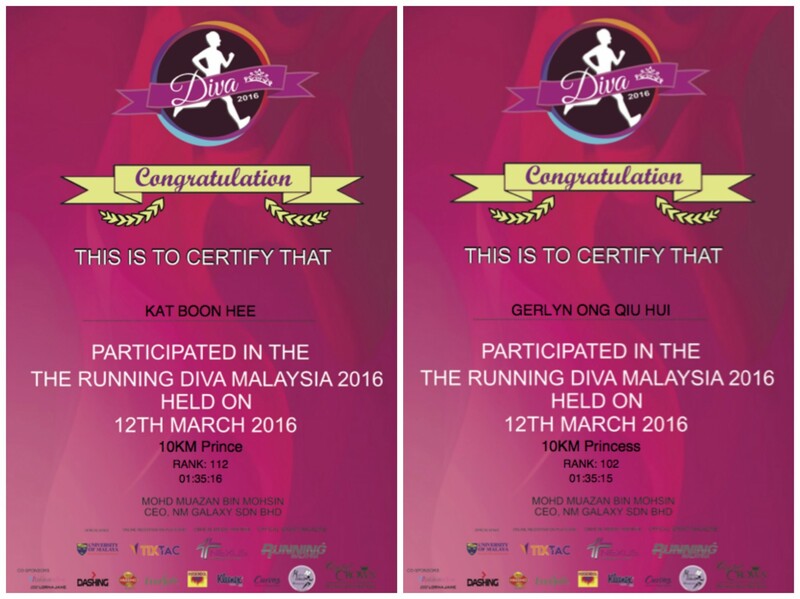 Race Review: The Running Diva Malaysia [10 km] (by Gerlyn) | JustRunLah! 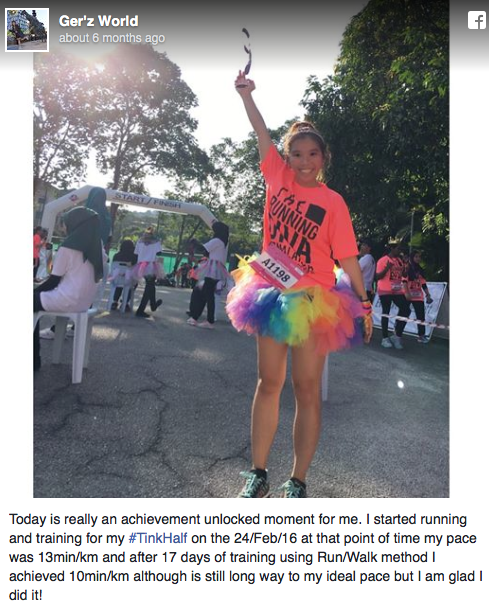 I hope you enjoyed reading my blog post on Tinkerbell Half Marathon a few months back! 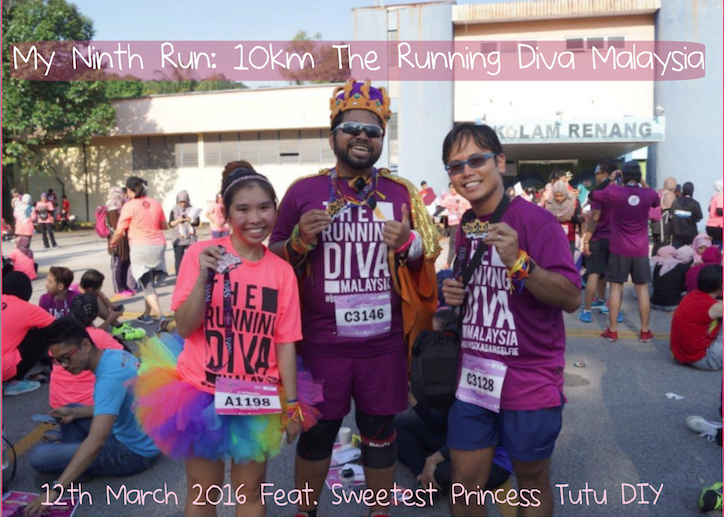 Today I will be sharing about this run I did when I just started running in February 2016. 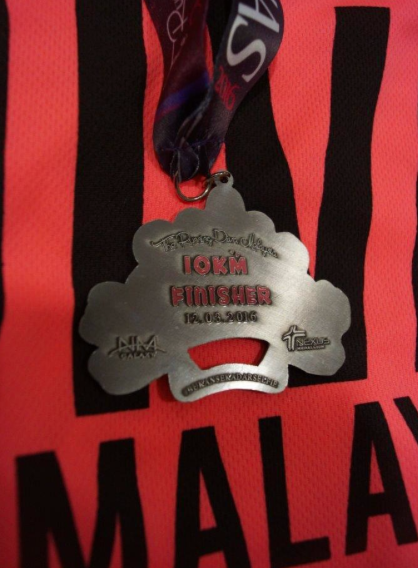 This race was my first longest run, 10km run and it’s pretty challenging due to it’s terrain with plenty of slopes, secondly it’s tough as it’s a Saturday morning run and we only arrived in Kuala Lumpur 4:30am earlier the same morning so we definitely lack of rest. 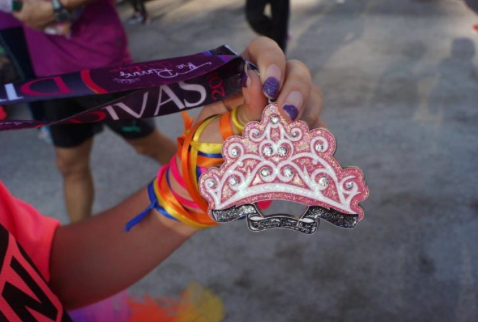 But glad that we endure through and managed to bring the pretty Tiara and Crown medals back home, Singapore. 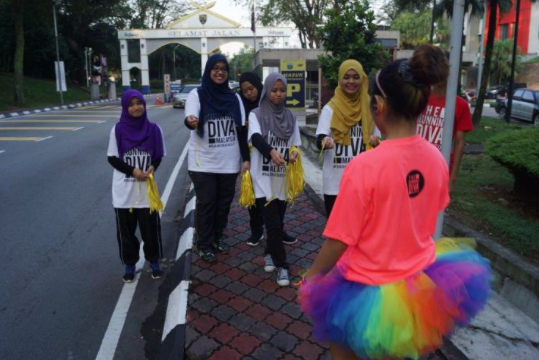 Without further ado, let me share some snippets of the race and the Terrain of the University of Malaya. *Note: Not the University of Malaysia* Why I asterick this? It’s because Casper (husband) drove to University of Malaysia instead and we are almost late. Not sure if I mentioned, on that day we travelled it’s a Friday night to a Saturday midnight / morning. 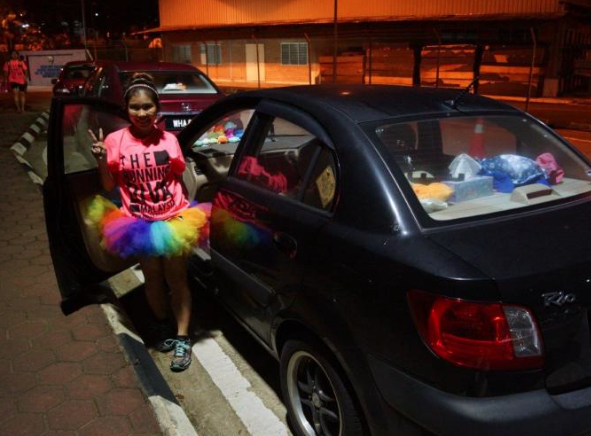 The second link custom actually suffered from unknown traffic jam and hence although we set off at 10pm but we arrived at 4:29am by right our expected arrival time should be 1am or latest by 2midnight. 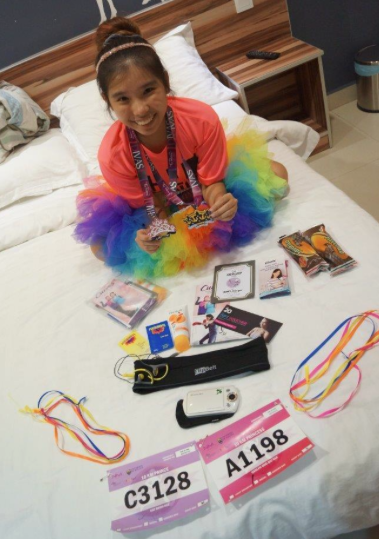 Unfortuately, we did not get to rest in the hotel but to check in and proceed to the race venue and collect our race pack, event t-shirt and bib. I have to change my shoes and shirt in the car. As there is no light in the set up portable toilet. 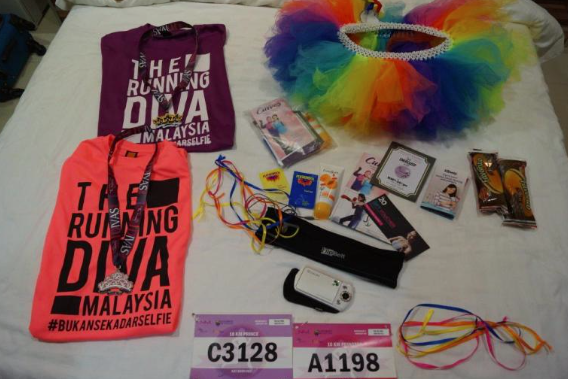 Yay I am ready and all geared for the race. But I am still very sleepy. 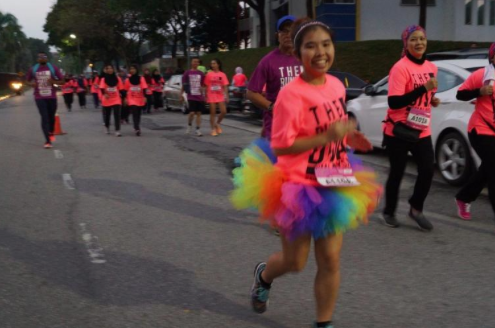 I felt like it’s a mistake to join races in KL on Saturday morning. If it’s a Sunday morning it would be so much easier. 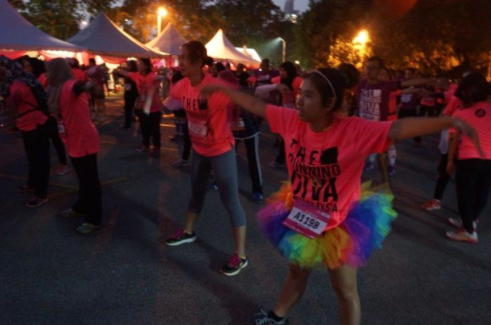 It was zumba session for warm up and all runners are getting all perked up and ready. 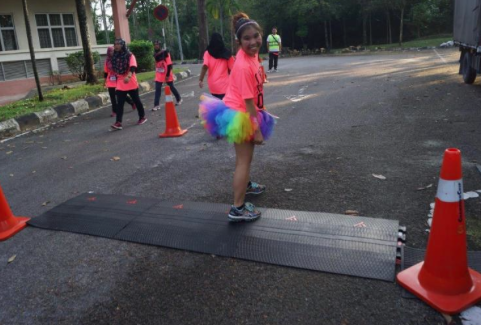 Queue starts forming near the starting line because we are about to start running! 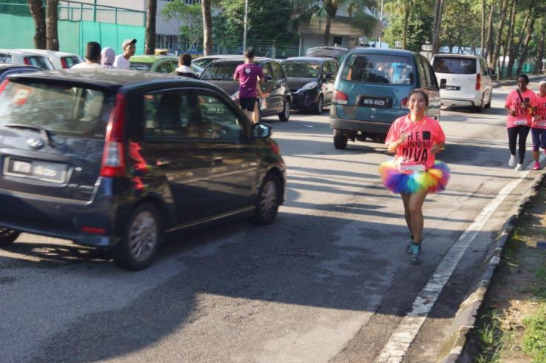 We ran pass lots of cars which park along the road side and mostly the cars are by participants of the race. In Malaysia races one thing you got to note is to arrive early why? To warm up? Not really… But to get a good “illegal” parking spot. Otherwise you would have to walk really far to the start point and at the end of the race walk really far back to the car. 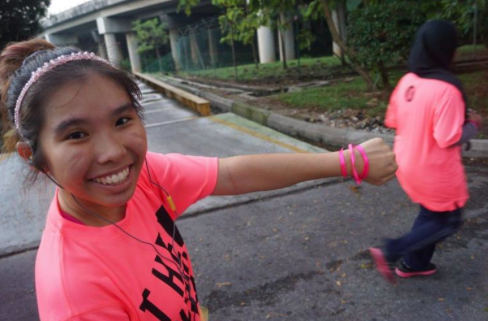 For this race, we are given pink ribbons for the first check point. 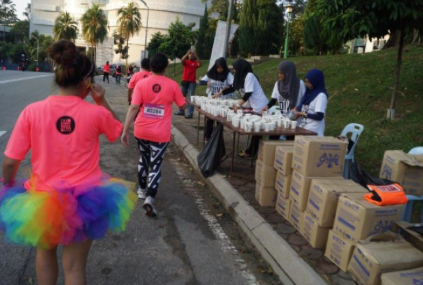 At the 2nd km we were given water and 100plus! For which I am pretty impressed as most of you know I dislike the lack of water points but this race actually have plenty of water points. 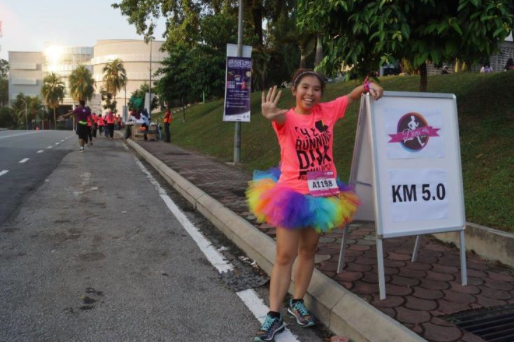 Even before 3km, we have water points. According to some regulation is 4km then we will get 1 water point but lucky us! Maybe I am a water bucket I need water every now and then hence I bring along my water point “Kat” which is Mr Kat, my husband. He will carry a bag of 2 x 500ml Ice mountain and 2 cans of 100plus. One bad thing about this race is the terrains. The “ups and downs” I called. 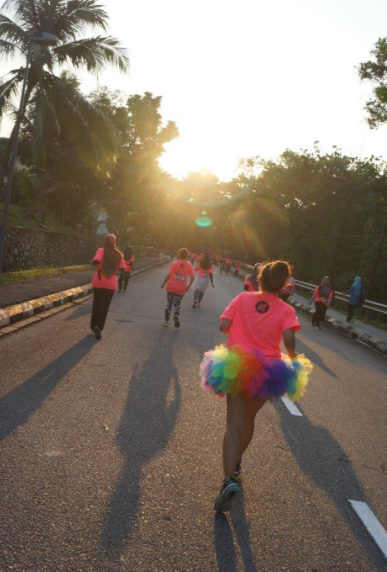 There is many hills and uphill courses which we have to run and you really feel like cheating them because after running uphill you need to come downhill again. It’s like so demoralising somewhat especially when you are tired. Hence in running, we need perseverance and willpower more than anything like “stamina” or “strength” or “speed”. Glad that I did not cheat and went uphill for the blue ribbon! Sometimes in life, there is Upz & Downz. I prefer the downs for this situation! 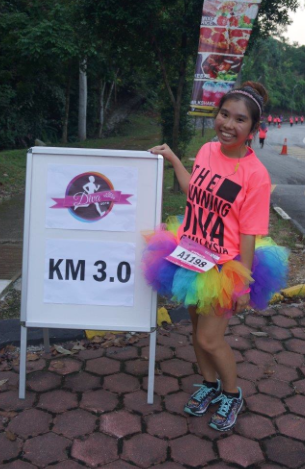 After the mini hill-climbing, I clocked 5km! High 5! This means I am halfway through this race! Guess what? It’s water point again! It’s so motivating to see water point and they really perked me up! 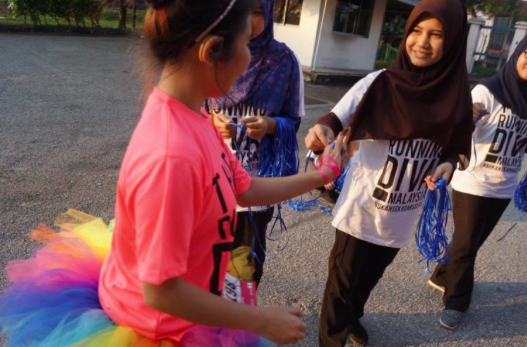 Another thing that really motivates me is the nice volunteers and coloured ribbons which I collected along the way! Met our Malaysia Running friend, Aizat. He is also a “costume” runner. 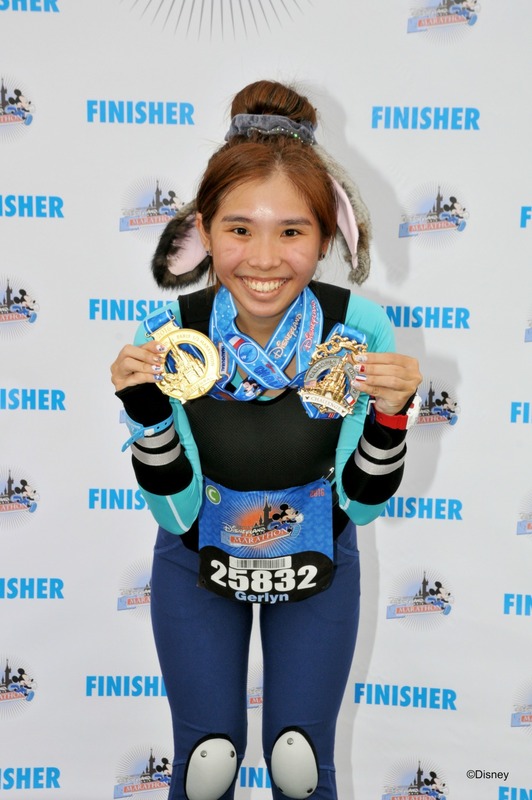 He frequently runs full or half marathons in costumes which I am pretty inspired to do so too. 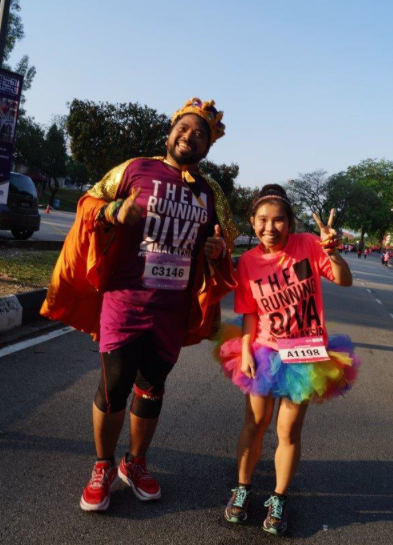 In this photo, I don’t run as fast as him because he is running downhill after reaching the digital checkpoint and for me, I am running uphill. This is the one and only check point they have for this race and it’s at the top of the hill. It’s really important to cross this check point for every single race. 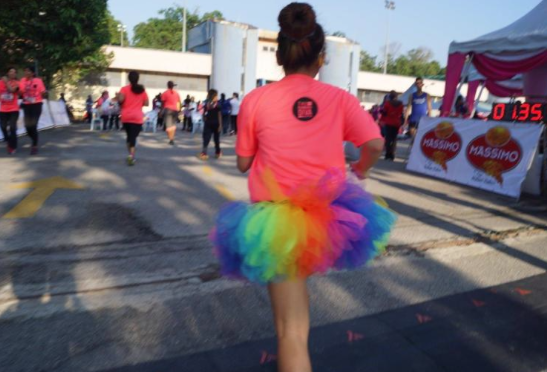 I was pretty slow for this race. Ok. Not just this race, I am always slow. 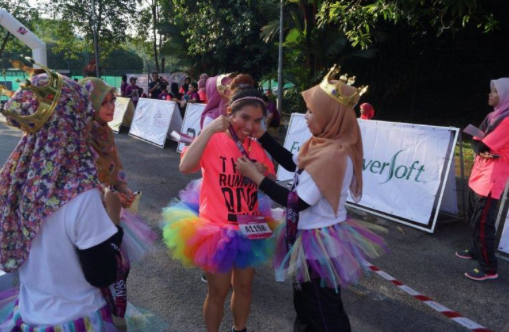 So as I am about to run to the finishing line, other participants who have completed their race are leaving the venue with their medals already. 1 hr 35mins gun time when I crossed the finishing line! 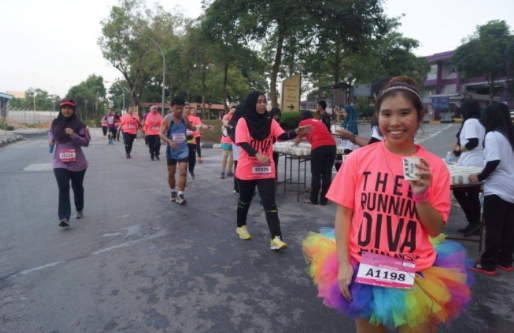 Hooray I have completed my first longest run of 10km! My first Tiara Medal one of the prettiest medal I ever have. 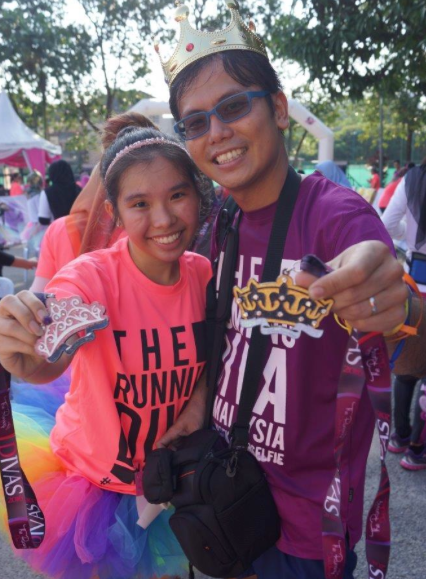 Our couple medals for the Prince and the Princess. Haha! What’s inside the goody bag? Face wash and mostly woman’s products. 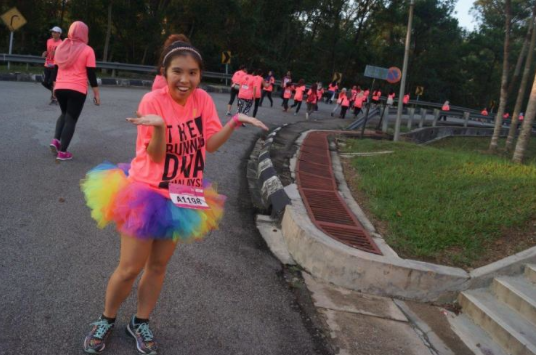 My tutu is again from Sweetest Princess Tutu DIY, Christine Low. 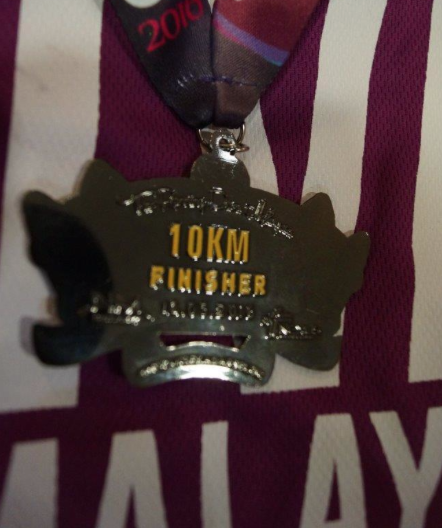 The back-view of my medal. The back-view of his medal. Our official timing is available here. This is our e-certificate too. It’s available here. 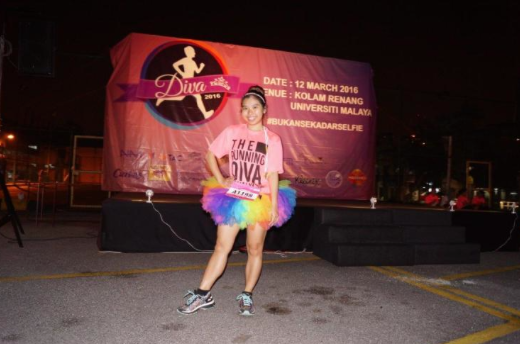 For more details and what happened after the race, click here to see the original blogpost on Ger’z World. 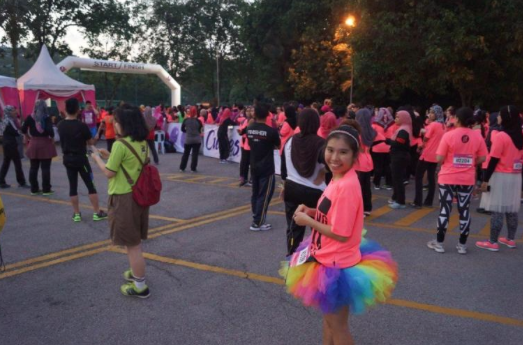 Where I’ll shared about Hello Kitty Cafe in Sunway Pyramid, Sunway Lagoon Nickelodeon Theme Park and many more! Once again, thank you for reading my blogpost again! See my previous post if you have not! 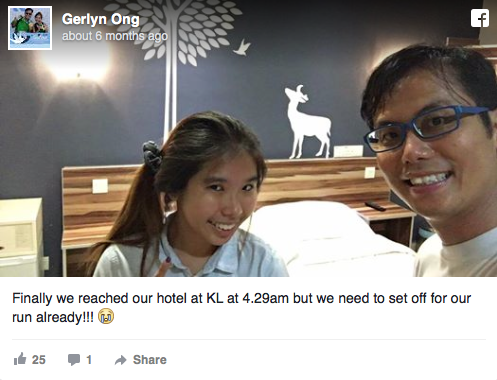 Click here for more post from Gerlyn.